Known for its diversity, Crystal Lake Golf Course features both traditional and links-style holes. More than a favorite among local golfers, this 6,306 yard, par 71 layout features two distinctly different nines designed by Williams Gill & Associates. The front nine is nestled along rolling hills and plays a traditional layout with various elevation changes, while the back nine incorporates the natural, reclaimed Minnesota wetlands creating a challenge to make each shot. 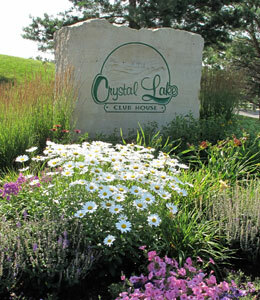 Crystal Lake offers a well manicured outdoor setting with beautiful flowers and extra touches throughout the property.